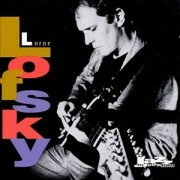 Guitarist Lorne Lofsky’s first album for the Jazz Inspiration label, and his first recording as a leader in 11 years, finds him in a much different state of development than on his prior Pablo release. Gone are the blues-influenced phrases, and the direct resemblance to fellow Canadian guitarist Ed Bickert (although Bickert’s presence is still evident in the advanced chordal playing of Lofsky’s music). What remains is a very aggressive, harmonically and rhythmically sophisticated player whose unique guitar style bears a striking resemblance to Bill Evans. The Evans influence is everywhere on this recording, from the choice of material (“All of You,” “My Foolish Heart,” “Solar,” and “Quiet Now” were all part of Evans’ repetoire), to the tracks which feature Lofsky overdubbing multiple guitars, a procedure Evans employed on several records. The trio is at its’ most furious on the title track, and on “All the Things You Are”; Lofsky constantly altering and displacing the harmonic movement of the tunes, while drummer Bob McLaren aggressively sets up false cadences and climaxes, disguising the form of the music. Solos by bassist Kieran Overs are often used by Lofsky as a means of further interaction, eschewing traditional chordal accompaniment, in favor of short phrases in response to the bassist’s lines (another trademark of Bill Evans). The rest of the album is somewhat lower key, although the music is always highly interactive and interesting. This is not a record for everyone; some may find Lofsky’s playing overbearing. For fans of the style, though, this comes highly reccomended.